Posted on May 29, 2013, in Big Ideas and tagged FIRST, marathon, regret, training. Bookmark the permalink. 7 Comments. 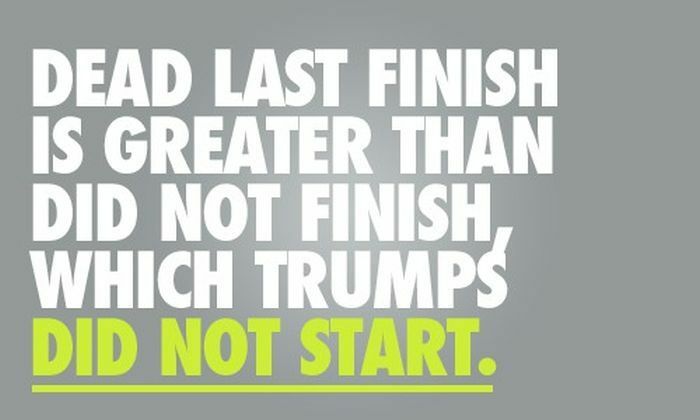 I’m a runner, too, but have never started a marathon. During a half-marathon I was running 2 yrs ago, my hip started hurting, and got worse and worse. I stopped at the medical tent and cried. It was mile 11, I had 2 miles left. I was going to wait for my husband to get me (he was already done) but somehow got back up and ran/walked the last 2 miles to the finish. I don’t look at that finisher’s medal with pride in my performance but more a reminder that when it gets tough, we have a choice. You have that same lesson in your life, too, and next time you’re faced with this kind of choice I’ll bet you’ll remember how you felt! I love your approach: marathon as muse is a fantastic perspective. Jennie – I admire your fortitude and I know that this time you will conquer your foe. In fact, it sounds like, by changing your mind (what else can we control?) you already have! I took a 7-month “sabbatical” in 2012, and training for my own big event was a glorious and liberating experience. Some may consider it self-centered, but it’s what you make of it. If you come out knowing and trusting yourself, then the next project will be even better. I’m looking forward to hearing how this story unfolds, mainly because I now know the back-story. Go Jennie! Wow, you were so close. I can see how this has bothered you. I applaud your desire and determination to beat that enemy with in you. I’m a firm believer in setting goals and not giving in. My son played little league. When he first began he was pretty good and played all the time. In his last year he struggled and spent a lot of time on the bench. One month into the season he came to me and said I’m done with this I’m quitting cause I’m not playing. I said no way….Know one quits you finish out the season you are part of the team. I told him that I would come home every night and work with him to improve his game which we did, and he improved. In the last week of the season he was starting games again. He was pretty pissed at me for not letting him give up for a while, but I think it helped him. Fast forward 10 years. He is now in the Marine Corp at Bootcamp. About week 9 (they are there for 12 weeks) I get a letter from him. In it he shared how tough and hard the training has been and that he was going to make it. Then he thanked me for teaching him that quitting was not an option. That by giving 100% effort he would be rewarded. He knew at that point he would make it through to become a Marine. I knew that day that my son had changed to become the young man I hoped he would be. Best of luck in knocking down your enemy! Thank you Larry! What a great story and metaphor for life- Thanks for sharing!